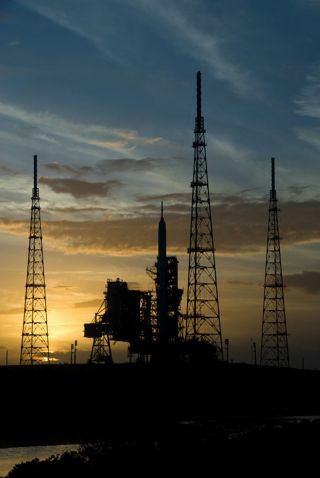 Sunset on Launch Pad 39B at NASA's Kennedy Space Center in Florida on Oct. 23, 2009, finds the Ares I-X rocket awaiting the approaching liftoff of its planned Oct. 27, flight test. CAPE CANAVERAL, Fla. ? Bad weather and a series of unluckyevents have thwarted NASA's plans to launch the prototype Ares I-X rocket on atest flight today. Launch teams tried repeatedly to lift off the rocket, butclouds, winds and the threat of rain prevented the flight. Launch was oftenfoiled by the "triboelectrification rule" - a law that prevents thevehicle from blasting off into clouds because it could trigger staticelectricity that may interfere with onboard instruments. At one point the rocket was poisedto launch to take advantage of a brief window of clear skies, only to be hinderedin the final minutes by an errant boat that had strayed into the danger zonewhich the rocket would flyover after liftoff. After that issue was cleared NASA intended to try againa few minutes later, but a cloud was spotted passing over the launch pad,violating weather concerns. Now mission managers are targeting a launch sometime withinthe next hour, and plan to take advantage of any clear skies that arise. The $445 million Ares I-X is the firsttrial version of NASA's Ares I booster, a next-generation rocket intendedto replace the space shuttle as a vehicle to carry astronauts to low-Earthorbit and, ultimately, on missions to the moon. The test rocket includes a realsolid-rocket first stage, with a dummy second stage and mock Orion crew moduleatop it. The $445 million experimental Ares I-X flight is expected tolast a little over two minutes. The rocket is slated to loft eastward, reachinga maximum altitude of about 150,000 feet, or 28 miles (46 km),before arcing back down into the Atlantic Ocean. The mission?s purpose is to collect data onthe rocket's design and performance. Cameras on the ground and aboard anairplane will gather visual evidence of the rocket's flight, while over 700sensors onboard will record comprehensive measurements. "There are no guarantees," Ares I-X mission managerBob Ess said on Monday. "We think we're ready to go from a vehicle pointof view. The whole point of tomorrow is to learn from it." Regardless of the outcome of Ares I-X, the ultimate fate ofAres I remains uncertain. Plans for the rocket, along with the Constellation programunder which it falls, are under review by the Obama administration. Apresidential panel submitteda report last week summarizing NASA's plans and offering a set of optionsfor the future.